All transactions are safe and secure with a reliable history in online purchasing behind each of our associates. Buy the Look to the Cookie t-shirt to own Seinfeld clothing and merchandise. The black and white cookie can teach us all a thing or two, as Jerry reminds Elaine. If we could all just look to the cookie, it would lead to a world filled with harmony. Pair it with a Seinfeld Kramer t-shirt or get a whole batch so that you can remind your friends to look to the cookie. After all, it demonstrates two races of flavor, the vanilla and the chocolate, living side by side. Order it with a Seinfeld Soup Nazi t-shirt. 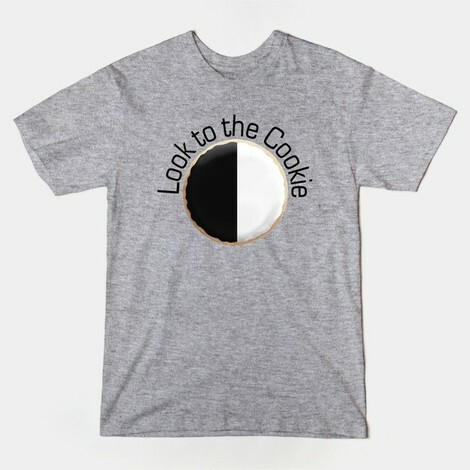 In addition to the Look to the Cookie tee above, browse the Seinfeld Clothing Gallery for more apparel like men's and women's clothes, kids shirts or hoodies.